Summary: The follow-up to a series best is one of the show’s weakest, but is saved by exceptionally fun performances from the Rogues Gallery. The Flash appears back in the previous night, having travelled through time. 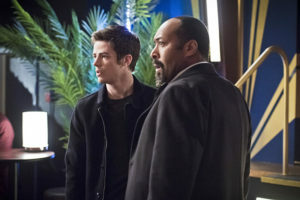 Upon realizing he’s reliving his day, he consults Dr. Wells, who forces Barry to keep it secret and do everything the same or else risk hurting the timeline. 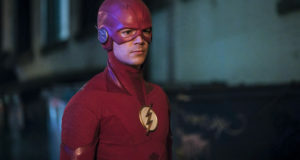 Barry instead decides to use the time travel to his advantage, nabbing Weather Wizard before he can wreak havoc and undoing the events of “Out of Time.” Wells warns Barry that time is fickle, and will potentially make things worse. 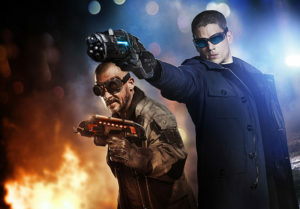 The worse for Barry is that Captain Cold and Heat Wave have returned to Central City. 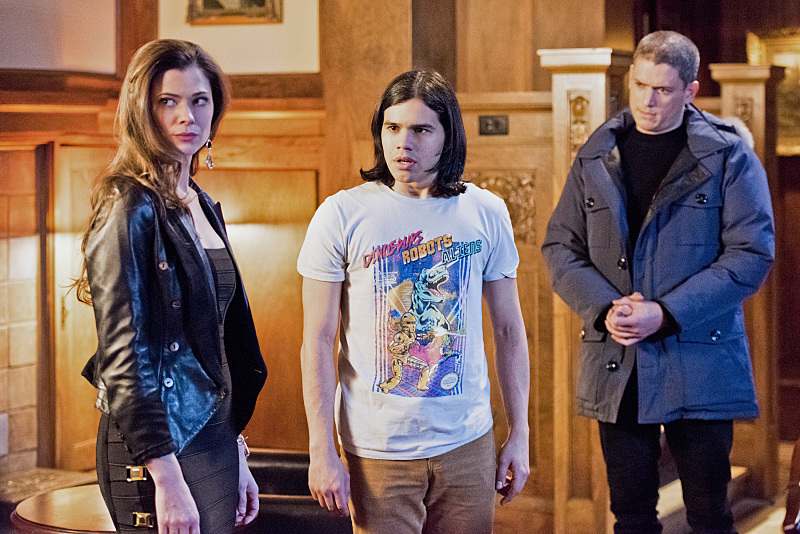 This time Snart has brought along his baby sister Lisa, and the three kidnap Cisco, who just had a bad experience returning to his scornful family for his brother’s birthday. As such, the Rogues kidnap Cisco’s brother Dante as leverage, too, forcing Cisco to rebuild their weapons and build Lisa a gold gun. Meanwhile, Barry thinks he can win Iris over just like he did in the previous timeline. After breaking up with Linda, he and meets Iris for coffee to convince her to break up with Eddie and be with him instead. Iris says no, and is in fact angry at the situation; Eddie, upon hearing it, punches Barry. The Flash learns that Cisco has been kidnapped and blames himself for messing with the timeline. Cisco and his brother are eventually let go…but after Cold threatens Dante, forcing Cisco to reveal The Flash’s identity. Cisco quits STAR Labs, but Wells convinces him to stay, as they have all made mistakes and Cisco only did what he did out of love for his brother. 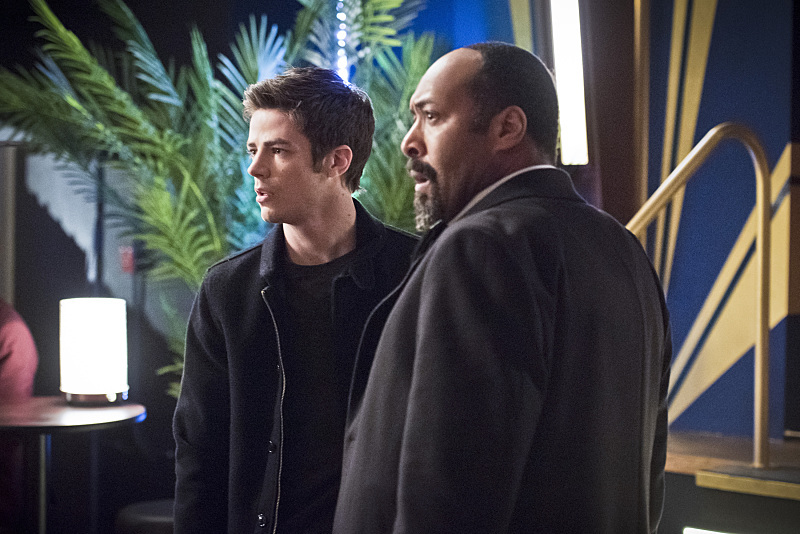 Flash, as Barry, confronts Snart, and convinces him to keep his identity secret if he lets him free. The one condition: the Rogues can’t murder anyone. Snart is only in it for the fun, and killing people or exposing Barry’s identity wouldn’t be fun. Meanwhile, Mason Bridge prepares for his story on Wells to go to print, but Reverse-Flash appears, murders him, and destroys all the evidence. Back at STAR, Barry tells Wells he understands the potential perils of time travel, and wonders if he can still go back in time to stop his mother’s murder. However, he sees the news report on Mason Bridge’s disappearance, and knowing Bridge had been investigating Wells, he goes to Joe saying he now suspects Wells…of everything. Time travel, right? 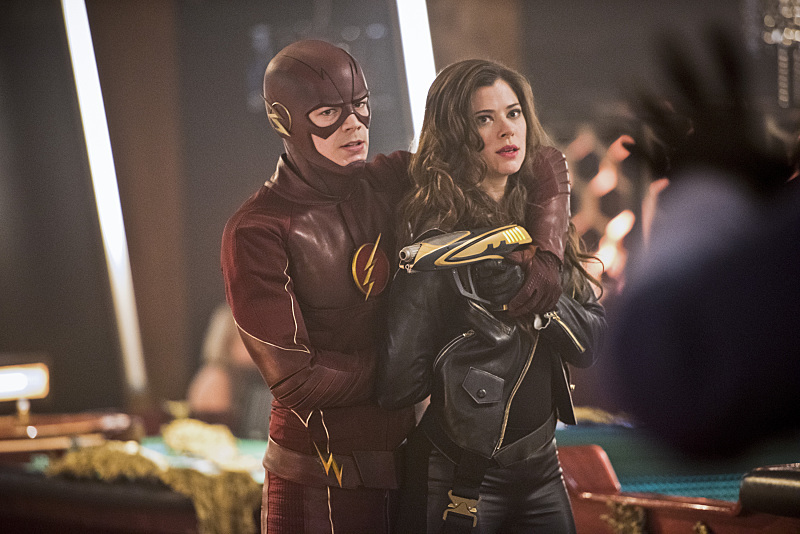 It makes it so easy to throw out all the most insane plot points — or inThe Flash’s case, basically have everything expected to happen in its season finale — without having to deal with the aftermath. “Out of Time” is incredibly indulgent in its last quarter, until Barry jumps back to the beginning and…anyone else getting a sense of déjà vu? The Catch-22 of crafting a do-over story is that you’re either destined to repeat, or so much changes that the original story becomes moot. I talked at length in the “Out of Time” review about how a story can circumvent this – most importantly, making the events that were undone still necessary for us in the audience. “Rogue Time” doesn’t make “Out of Time” feel like a waste of time, necessarily, but it doesn’t validate that story’s existence as more than an adrenaline rush, either. As simple as it may be, it’s possible that “Out of Time” and the opening of “Rogue Time” may have worked better as a singular episode, concluding with the do-over and firmly placing itself as essentially an imaginary story. People would have still screamed “cop-out” – and, well, it would be one. But it would be clear that “Out of Time” is meant to be nothing more than a wild ride, not something wholly imperative to the story. The writers unfortunately painted themselves into a corner with this one, because ending “Out of Time” on that cliffhanger is what made that episode successful while simultaneously making “Rogue Time” kind of lackluster. 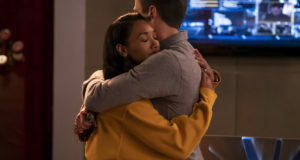 The former is set up to be a much bigger turning point in the show, but the latter doesn’t find importance in much more than the hard-to-like Barry/Iris subplot. Even the time travel gimmick itself is surprisingly irrelevant after around the first quarter. Generally everything that happens in “Rogue Time” could happen if “Out of Time” were skipped, and Barry’s lesson that “time travel makes everything worse” (which he’s wrong about because of, you know, that tsunami) makes his discovery of the power kind of unnecessary. I hate saying that, because I normally dig time travel stories. And the show needed to dip its toes in the concept eventually, considering how largely it will play into the overarching storyline. But part of the problem is that, even with this as an introduction to the mechanics, the rules are also still just as unclear. With Wells refusing to exposit, we’re forced to make assumptions on exactly what happened. It’s probably okay to leave the how a bit mysterious, if only to provide more mystery for how Barry will inevitably travel back to his childhood. But the mirror Flash is still hard to grasp; the best explanation is likely that the two timelines intersected briefly before diverging…and somehow making the second Flash disappear, because “time finds a way,” I guess. Credit to the show for keeping things vague, since it makes it easy to rationalize the inevitable time plotholes, but something like Barry seeing himself vanish from existence should have been worth commenting on. Either way, if the goal here is to make Barry question whether or not he should travel back in time to save his mom, it isn’t especially effective. Particularly because he won’t be trusting Wells’ words anymore anyway, a development which would have probably happened in some capacity in both timelines. It’s a shame that this stuff is hanging over the episode’s head, because in its own bubble, “Rogue Time” is a typically fun episode, even if one that isn’t much above average. The officially coined Rogues Gallery is a perfect example of what people love about the show, and Wentworth Miller and Dominic Purcell have grown into their delightfully over-the-top roles even better this week. 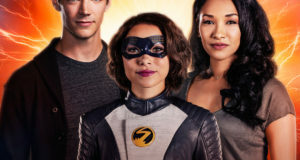 Peyton List fits in just fine as Lisa Snart (the as-of-yet-unnamed Golden Glider), not as hammy as her male counterparts but certainly revelling in playing a villain. The only problem is her weapon set, which is a fun adaptation of the comics’ jewel-themed weaponry, but just kind of gets thrown in unexplained. 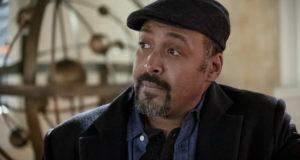 We don’t need technobabble for every little thing that happens on The Flash, but considering this show’s knack for usually having fun with its exposition, it seemed odd to have a weapon as strange as a King Midas-esque gun barely being explained. Wrapping our heads around a cold gun and heat gun is pretty simple, but there are so many questions about this thing: is it actual gold? If so, why are they stealing when they can literally convert anything into gold? And if it isn’t real gold, is it a mixture coating things in a gold-like substance, or converting other matter into that gold-like substance? Lisa’s gun is pretty and all, but it’s too weird to throw in without any sort of exposition. Both Miller and Purcell have found the best balance yet in playing their scenery-chewing villains, toning down the cartoonishness of “Revenge of the Rogues” but retaining the unique and comic booky speech style of their characters. It takes skill to channel the over-the-topness equivalent to a Power Rangers villain while making sense in the realm of a show that isn’t aimed at children. If Miller and Purcell really are making their way to a spin-off, that all-but ensures the new series will need a wildly fun tone. These guys wouldn’t really work as well in a show like Arrow, after all, same universe or not. Part of the success of Captain Cold in particular has been his very simple but very clear characterization. He’s calculating, creepy, and cold (heh) due to the sociopathic tendencies he developed from a bad childhood — so basically, ever villain ever — but his goals are squarely out of selfishness and greed. He wants money and things because money and things are great, and the act of stealing money and things is fun. Yeah, those sociopathic tendencies are what gives him an obsession with The Flash and has him almost kill Cisco’s brother with frostbite. But he’s not downright evil or psychopathic, as evidenced by the stellar confrontation between Barry and Snart, all masks off. Barry has to pull a big gamble with Snart aware of his identity, but having those cards on the table reveals to Snart that Barry is a sensible enough guy. Killing and/or ruining someone who actually understands and even respects Snart’s intellect would be counterproductive to the fun of the chase, and Barry wriggles enough to extend that to not killing civilians, too. Is it a bit of a stretch that Barry would feel comfortable letting Snart go given these circumstances? Sure, it’s a gamble. But Miller has been careful to not play Snart as a completely despicable human being — again, clearly in this all for the fun and the money — so it’s believable that he’d honor Barry’s wish for the sake of keeping the game. That weird respect between the hero and villain and their cat-and-mouse game is a classic comic book staple, and it’s fun to see it having developed over the course of multiple appearances. Cisco gets another week full dramatic things to do, which has done wonders for the character. Carlos Valdes is perfectly capable of handling the weight of this darker material, whether it’s Wells’ big secret or some pretty screwed up family drama. Cisco’s backstory isn’t tragic or traumatic per se, but it is relatable and relatively realistic. Usually the parents are supporting the scientist and disparaging the artist, so the twist that Cisco’s concert pianist brother, Dante, is the successful one is a little weird, but it’s still no surprise that Cisco is the black sheep. We get the heartwarming reconciliation between the brothers and the reveal that Dante isn’t all he’s cracked up to be, that Cisco should have been the favorite, etc. — nothing terribly surprising. The main reason this story succeeds is because of Valdes’ performance and because we’ve grown to love Cisco, and it’s not all that cathartic when he hears his brother respect him considering how awful his family has been portrayed. But Valdes does handle the Sophie’s Choice material, and his subsequent guilt over it, adeptly. Cisco’s story also gives way to the extremely creepy reprise of Wells’ “You are like a son to me” dialogue, which is the best use of the do-over premise in the whole episode. The worst use of the do-over premise, though, is everything about Barry’s relationships, unfortunately. Again, the relationship stuff on The Flash really hasn’t been that bad, all things considered — I challenge the Iris-haters to take a peek at Lana in Smallville circa season 3-7, or Laurel in Arrow season 1 for how bad love interest plots could get. Iris hasn’t been given much to do this season, but Candice Patton has been a delightful enough presence. Unfortunately, the romance antics have taken a turn for the melodramatic now that it’s evolved from an unrequited Barry and an oblivious Iris into a rather messed up situation of denial and entitlement. While Grant Gustin tries his best to make Barry’s excitement and determination charming, Barry comes off as rather dumb and annoyingly smug. It’s bad enough that it takes a self-admitted Netflix-lover so long to realize he’s travelled through time, despite having it explained in terms of pop culture not long ago. When he does finally get it, he then forgets how human emotions work — when there’s a tsunami threatening to kill everyone in seconds, of course emotions are high. So for Barry to think he can get Iris to break up with the man she’s living with, despite him practically being the perfect boyfriend, all over coffee…he didn’t think this through, to put it lightly. He’s determined enough that he breaks up with his way-too-cool-for-him girlfriend Linda, which she’s clearly been expecting considering how she all-but pushes him to do it. And he paints Iris as being in the wrong when, again, he’s asking her to break-up with her longterm boyfriend out of the blue. Yes, love makes you crazy, but Barry has his exuberance and persistence on overdrive, and it doesn’t make him look like a very good guy. He undoubtedly deserves that punch from Eddie when it happens. The “lightning psychosis” explanation Caitlin uses to wrap all that drama up in a nice bow is a decent analogue for this episode. The concept competent enough in the context of the world, nothing close to a jump the shark moment or anything. But it’s also a little too lazy, a silliness and suspension of disbelief that this show can handle sometimes going too far over the threshold. The Rogues of “Rogue Time” are exceptionally fun, and save this episode from being a slog. But the framework that set up the adventure should have led to something much better, especially given the quality we expect from The Flash. For those who missed it: Dante calls Cisco “Mija,” which is slang for friend…female friend, specifically. Hence Cisco’s annoyance. Dante’s not only a jerk, but it’s also subtly sexist, too! Wells is very concerned about Barry travelling back in time, but shouldn’t he be happy because it means he’s a step closer to his goal? Also, expect Wells’ dialogue to get even more on-the-nose with his time puns now that we know exactly who he is. Case and point: his whole spiel about getting lost “centuries in the past.” If you think about it, he’s very bad at keeping his secret. “I’m always weird.” – You got it, Barry. Previous: Flash “All-Star Team-Up” Description – Felicity & Ray Visit! Mija is shorted from “mi hija”. Which means “my daughter”. Spanish-speaking parents use “mija” and “mijo” for their kids.